Exams are around the corner and Nickelodeon, the kids’ entertainment channel, has brought a new campaign to help kids unwind during these stressful times. The franchise is all set to flag off a high-octane campaign, Nickelodeon ‘Masti ka time table’ and Sonic ‘Shiva banaye exams cool’. Powered by United Colors of Benetton, the campaign will be brought alive on-ground by a high-decibel school contact programme across 250 schools spanning over eight cities over the next few weeks. The franchise is all set to make exam time stress-free through an engaging and exciting line-up of activities, which will help kids develop presence of mind and study smart. Nickelodeon’s ‘Masti ka time table’ will see a series of entertaining promos showcasing various fun ways to deal with exam stress. With this campaign, the channel aims to help kids plan their day better with regular breaks, ensuring there is balance between study and play. The series of fun promos coupled with a robust digital, social media and on-ground presence is designed to engage with the young viewers at different touch points. 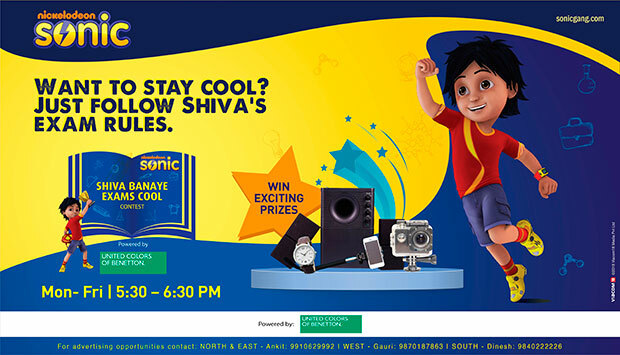 On Sonic, ‘Shiva banaye exams cool’ will provide children smart tips from Shiva to stay cool by following simple exam rules! Armed with easy exam tips Shiva is all set to add a fun element to the stressful season. Kids need to tune in to Sonic every evening from 5:30 - 6:30pm and answer simple questions and stand a chance of winning exciting prizes from their favourite toon, Shiva. So, keep watching Motu Patlu from 6:30 pm- 7:00 pm; Gattu Battu from 7:00 pm - 7:30 pm on Nickelodeon and Shiva from 5:30 pm - 6:30 pm every Monday to Friday. Tags: Nickelodeon de-stress kids this exam season!